This procedure addresses excess skin and tissue laxity of the arms usually secondary to significant weight loss. This comprehensive surgical procedure often addresses multiple areas including the upper flank, axillary (arm pit) areas, upper arms and extension to the elbow. Excess skin and fat is removed during this operation to reduce and tighten the upper arms, axillary areas, and upper flanks, and improve the overall contour. The incisions are placed in such a way that the resulting scars will be as hidden as possible. Dr. Simon will discuss with patients possible alternatives, however, if there is significant laxity which may occur with or without massive weight loss, some sort of brachioplasty may be the best solution to provide an optimal outcome. Despite fears of a difficult and painful recovery that many patients may have, the process is much easier than expected. A compression garment is worn during the early postoperative period and patients will experience mild to moderate discomfort for a short period of time and return to their normal daily activities quickly. Arm lifts are often combined with other surgical procedures as patients with significant weight loss may require multiple areas addressed. Combining procedures as deemed reasonable by Dr. Simon may allow patients to accomplish their aesthetic goals much faster, with less overall recovery time and at a cost savings. Breast lifts (with and without implants) are the most frequently combined surgery at the time of an arm lift in Dr. Simon’s practice. There are of course many men that are good candidates for arm lifts as well. 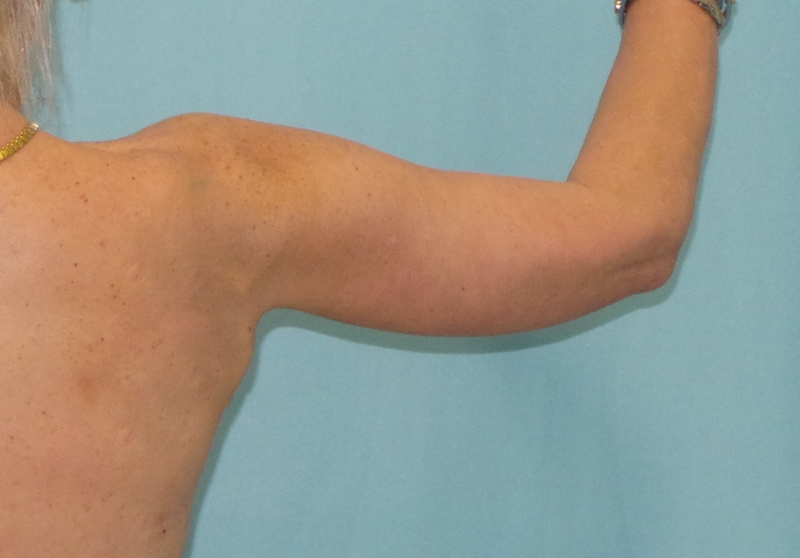 Arm lifts are typically performed on an outpatient basis in Dr. Simon’s Plastic Surgery center. Patients are instructed to arrange to have someone take them home after surgery and to supervise care for the first night following surgery. Overnight stay in our recovery facility is also available as well has home nursing services. Dr. Simon will design the incision to leave the resulting scar in an inconspicuous location so that it is as hidden as possible. The overall length will depend on the amount and location of the skin and tissue laxity and will be discussed during the consultation. Liposuction may also be considered, and if performed, the incisions are often placed within the skin to be removed and therefore will leave no scars. Dr. Simon and his office staff will make your surgical experience as easy and comfortable for you as possible. You will discuss with Dr. Simon your areas of concern and your goals from arm lift surgery. Dr. Simon will examine you to determine the best procedure for you which will lead to the optimal desired outcome. Any possible alternatives will also be discussed. Dr. Simon will spend as much time as necessary with you to make you feel comfortable and answer all of your questions. Patients will also meet with a surgical coordinator and will be provided with more information regarding their procedure of choice. You will see Dr. Simon and his assistants 1-2 days after surgery for the first follow up an appointment. Dressings will be removed and further instructions given. You will be permitted to shower after this first visit. The next appointment will be made and there are typically 2-3 more visits in the first few weeks. The general recommendation is to take at least one week off from work for recovery. There is great variability in the recovery period between patients, however a period of one week is typical for return to work and driving. The subject of risks and potential complications of brachioplasty is best discussed on a personal basis between you and Dr. Simon at the time of your consultation. Some of the potential complications that may be discussed with you include bleeding, infection and reactions to anesthesia. Following a brachioplasty, you may have areas of temporary numbness which rarely may be permanent. Wound healing problems are uncommon but can lead to increased scarring which may necessitate additional revisional surgery. This is an area of the body that may be subject to poor scar healing in some patients. Dr. Simon will discuss this possibility and the additional therapies that are offered to improve the scars such as laser treatments. The improved contour of your arms as well as adjacent areas such as the upper flanks will be long lasting. Maintenance of a healthy lifestyle including appropriate diet and exercise will always be beneficial to optimizing the results.